Jim Finn shows how the Warren Commission Issue of Life Magazine went through at least two redactions in which the frames and captions presenting the fatal shot were changed in order better to bolster the official conclusion. This was not the first instance of such duplicity for Life. 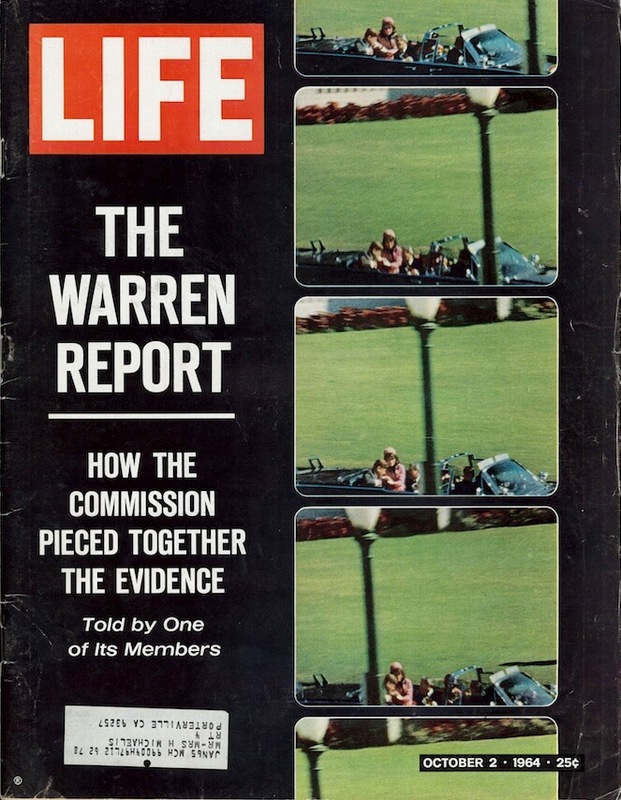 Like most of us who are interested in the Kennedy assassination, I was aware of the existence of different versions of the Life Magazine Special Warren Commission issue dated October 2,1964. I had read that there were three versions of the issue. 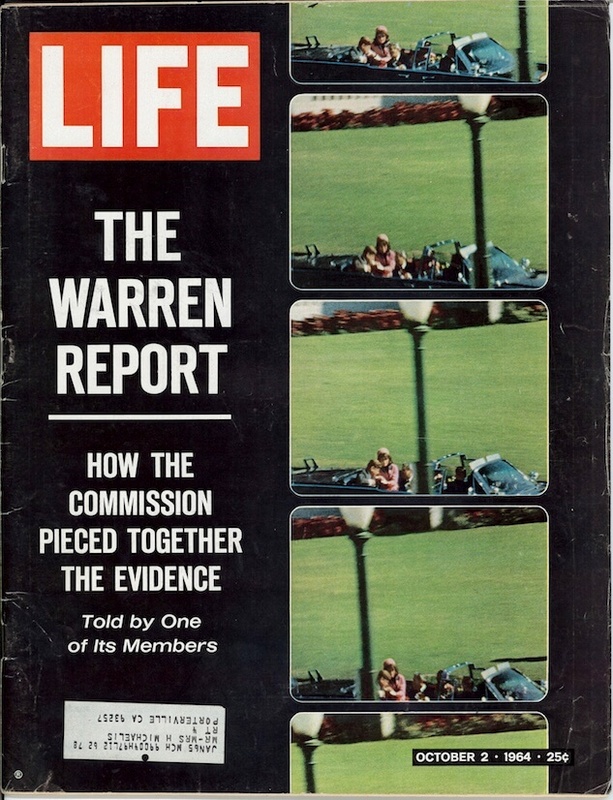 The explanation researchers have given for the different versions is that Life Magazine was trying to make the issue released to the public (the newsstand issue) support more clearly the lone assassin Warren Commission verdict. It turns out that I subsequently was able to confirm firsthand the existence of at least two different versions, by a bit of serendipity. I already possessed the newsstand version, but wanted a copy in a better condition. I checked out the best issue on e-bay that was available and purchased it. When I received my newly acquired issue, I was surprised at my new find. It was indeed different from the newsstand issue that I previously owned. It appeared to be the first version of the three versions of this issue that Life produced. 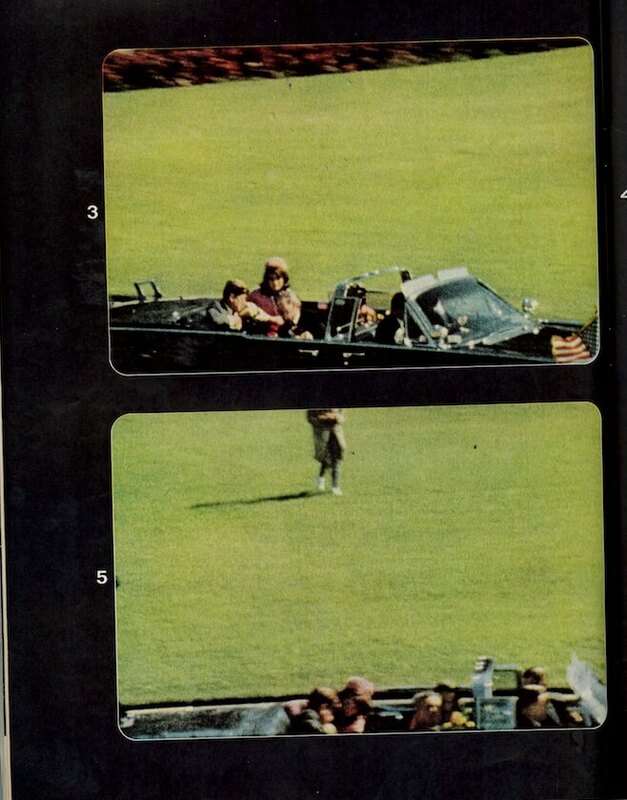 Version one [V1]: issue with different frame 6 of Zapruder film stills shown and different caption describing frame 6 shown (different from newsstsnd copy). This copy I possess. 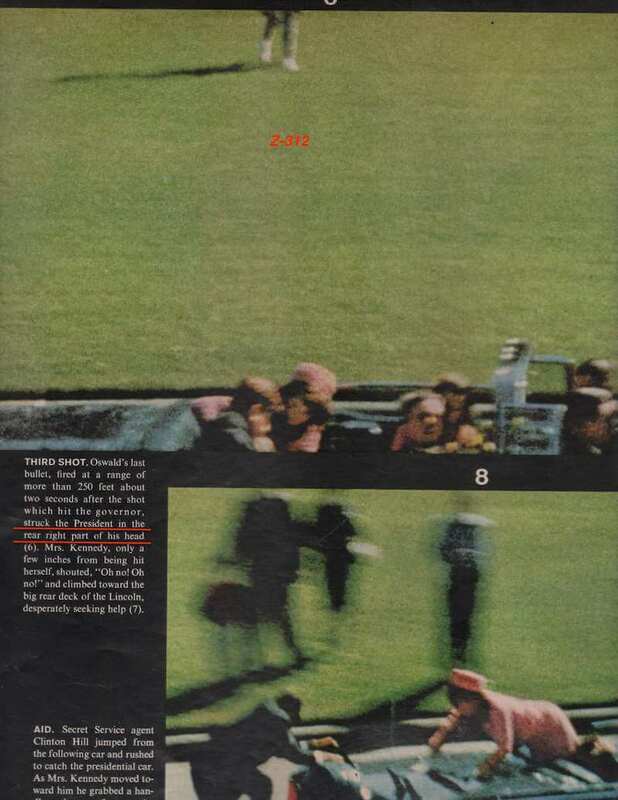 Version two [V2]: issue with different frame 6 of Zapruder film stills shown (different from newsstand copy) and caption describing frame 6 the same as the newsstand copy. This is alleged since I do not own this version. Version three [N]: newsstand issue. This one I possess. These were produced in the order shown above, with version three being the final result sent to subscribers and the newsstands. 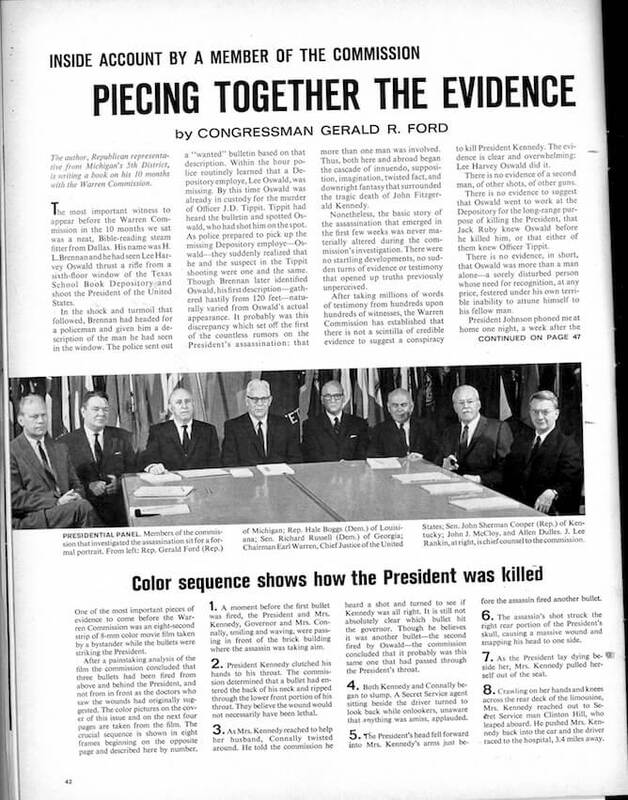 The feature begins with a story by Gerald Ford on the workings of the Warren Commission. 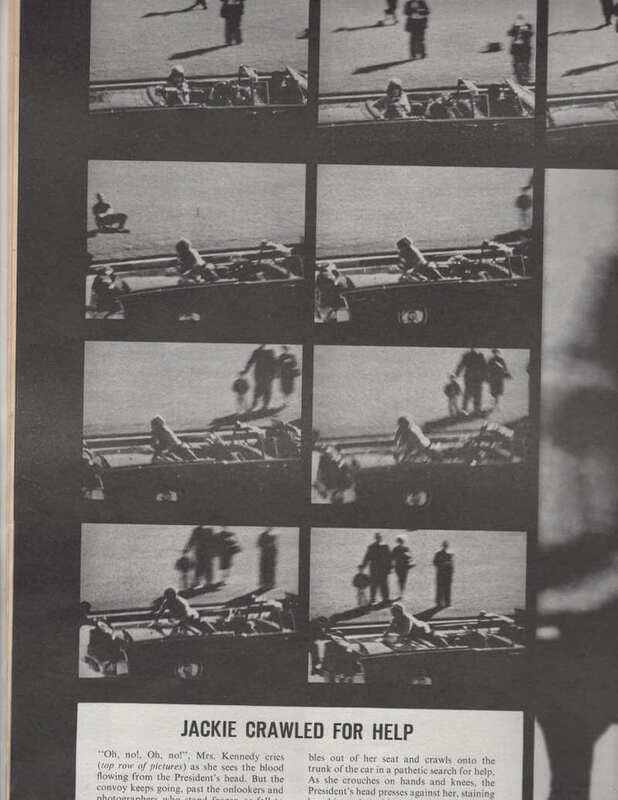 On this same page are also eight captions describing the corresponding eight still frames of the Zapruder film displayed on the next four pages. 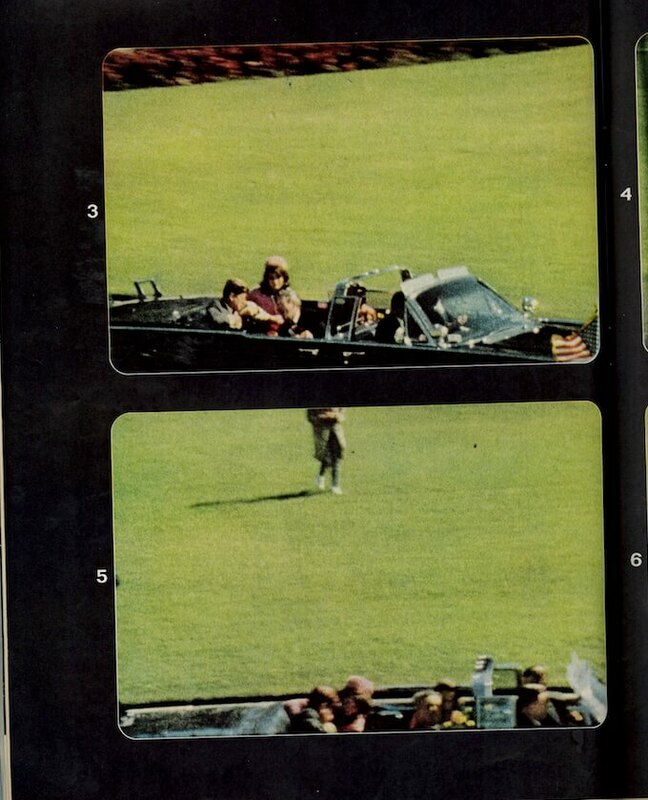 The difference between the two issues (I reserve comment on the putative second version [V2] since I have not seen it) centers on the frame 6 Zapruder film still and its corresponding caption. 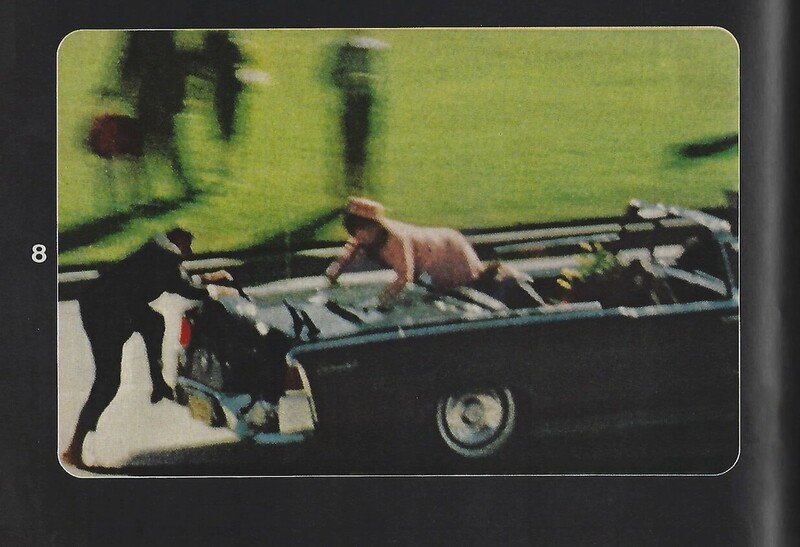 The earlier alternate version [V1] (produced before the final issue version was sent to the newsstands) shows JFK’s head and body up against the rear seat cushion, suggesting, when seen in sequence with the preceding frames, that he had moved backwards and to the left (see exhibit 12). This frame corresponds to Z-323. 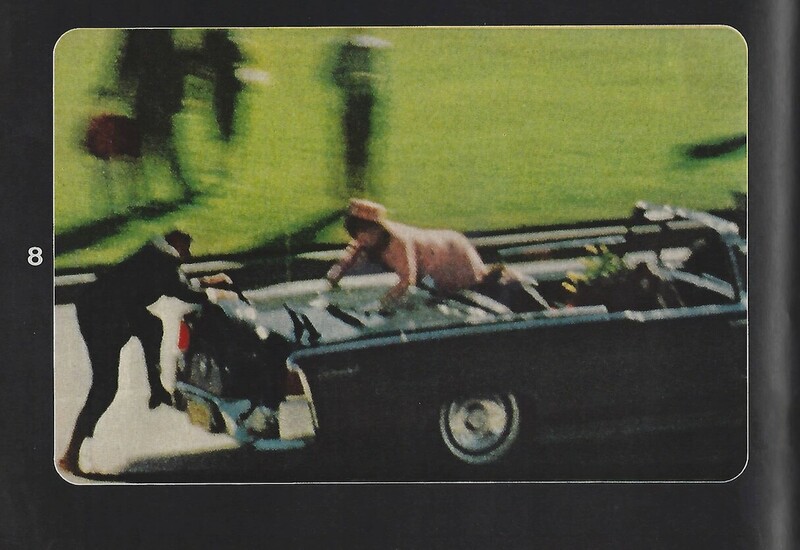 The caption for this frame on page 42 reads as follows: “The assassin’s shot struck the right rear portion of the president’s skull, causing a massive wound and snapping his head to one side” (see exhibit 9). The caption, however, seems to be telling you something different from what your own eyes tell you. Would you, from comparison with frame 5, exhibit 11, be led to conclude that JFK's head was “snapping to one side” or backwards and leftwards? 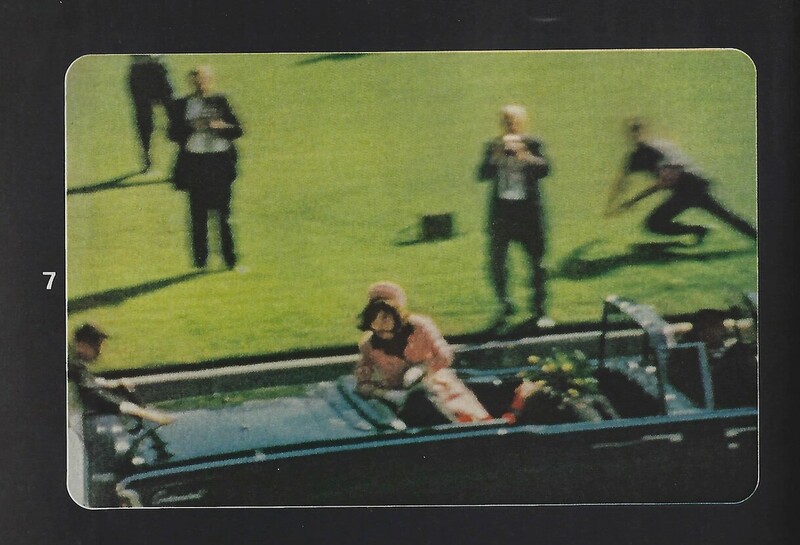 With the newsstand issue [N], this Zapruder frame has been swapped out in favor of Z-313, which shows the famous halo of red exploding on the right side of JFK’s head (see exhibit 5). 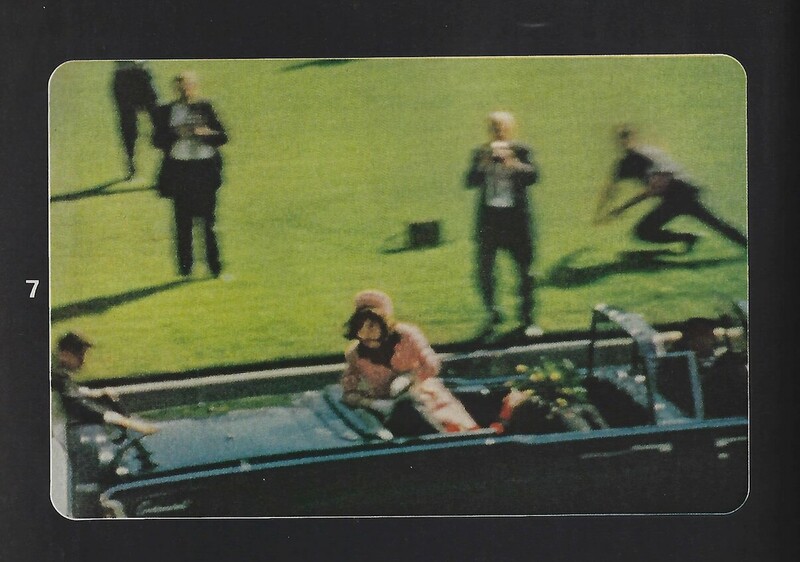 The caption for this version now reads: “The direction from which shots came was established by this picture taken at instant bullet struck the rear of the president’s head, passing through, caused the front part of his skull to explode forward” [sic] (see exhibit 2). While arguments have been made that the preceding frame, Z-312, in sequence with this one, shows the head moving forward, that motion (which may not be due to a bullet strike) is so imperceptible as to be negligible to the normal viewer, much less one perusing a selected sequence of stills. In fact, judging from the motion of the head, there really is no unequivocal proof of a bullet strike from the rear in the film, much less so in the frame that was originally chosen to represent the fatal shot (Z-323). One can only conjecture here that this was recognized by redaction. The misleading description of what is depicted in Z-323 already raises the suspicion that the authors of the feature struggled to choose a frame for the fatal shot which would unamibiguously support the offical story. The further possibility that Z-323 might actually suggest just the opposite (motion backwards) must have eventually led them to opt for the more gruesome frame they were evidently avoiding, because the latter showed that some blood, brains and skull went forward, implying (for the non-expert, at least) a rear-to-front bullet trajectory. 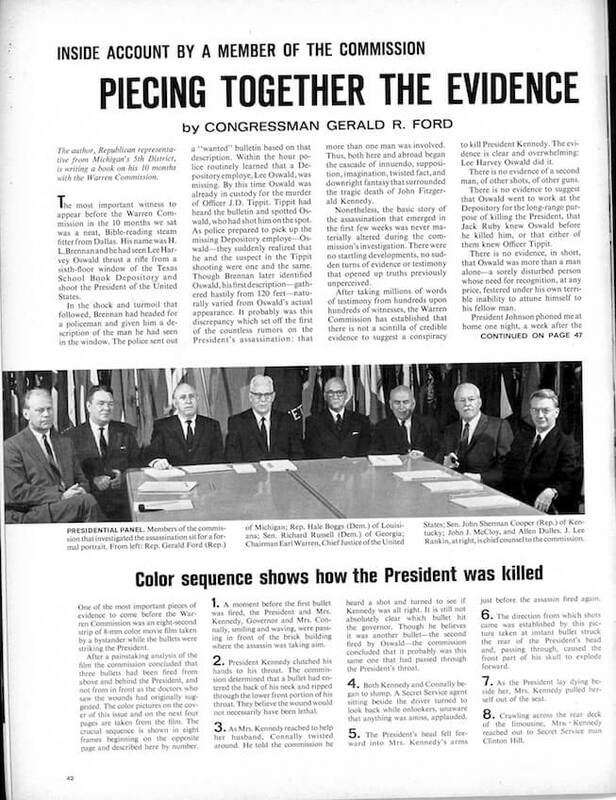 It is the substitution of this telltale frame and caption that suggests an effort to make the newsstand version of the Life issue better conform with the Warren Commission’s single assassin findings; the swap was ostensibly made both to be more visually consistent with them, and to mask from the public the motion of Kennedy’s head and body which could denote, even via a still sequence, a bullet fired from the right front. There is a rather bizarre déjà vu in this legerdemain by the editors of the October 2, 1964 Life issue: something very similar had already been done once before. 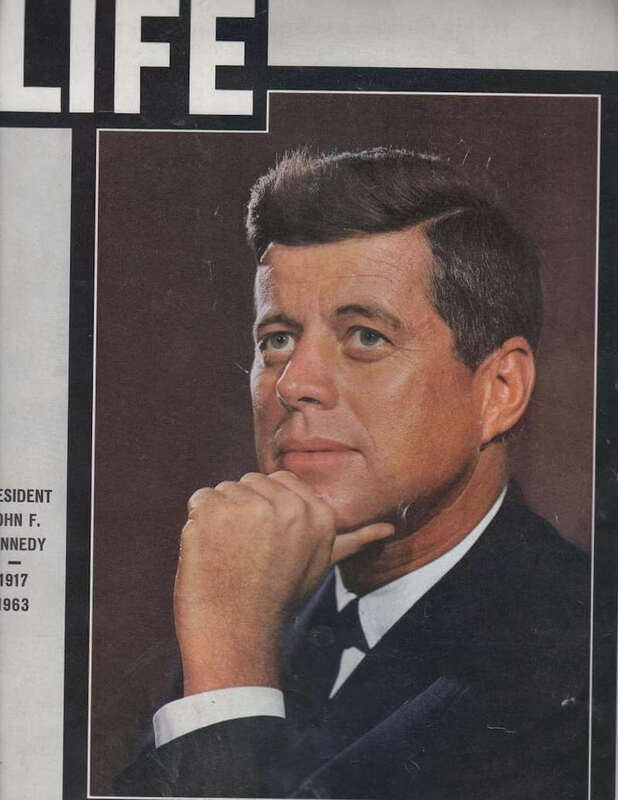 On November 29, 1963, Life published an issue mainly dedicated to John F. Kennedy and the assassination. This was a regular issue in that it contained, along with the assassination reportage, the usual full-page ads, unrelated features, and so forth. Shortly thereafter, Life decided to excerpt and rerun the relevant material from the November 29th issue in a separate, ad hoc volume, the John F. Kennedy Memorial Edition, of about 80 pages in length (only about 20 pages less than the total number of pages in the regular issue). The date is not clearly given on the cover or credits page, but the issue appears to have been published December 14, 1963. As can be seen from the covers, these two versions are readily distinguishable. 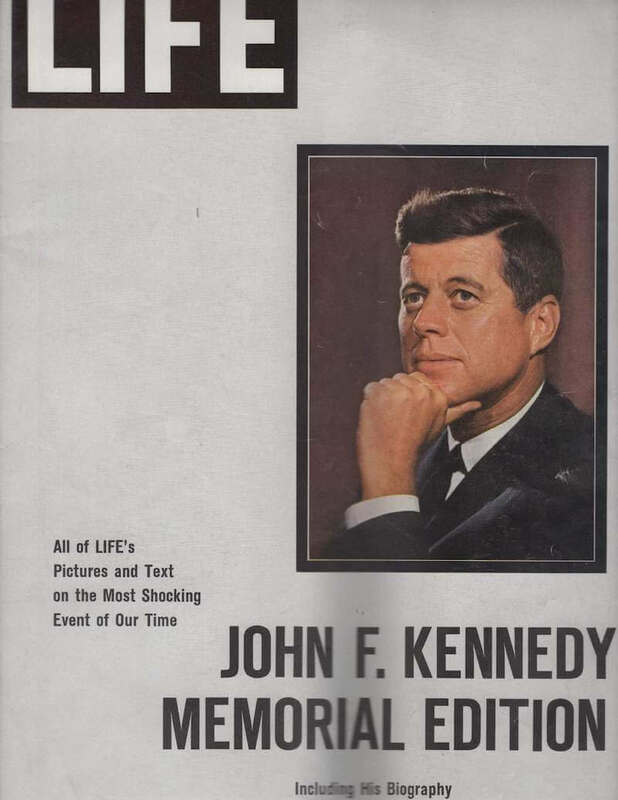 The special edition, while carrying over what was originally published on November 29 (including the insert on LBJ), has also greatly amplified the text and photos for its now multifeatured retrospective on Kennedy's life, presidency, and assassination. 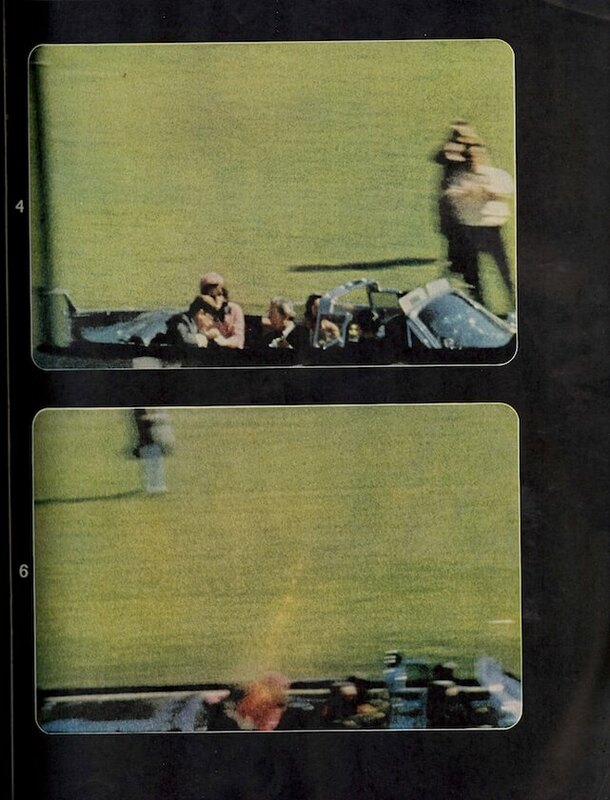 But what is most noteworthy for our purposes is the difference between the two versions in their respective presentation of the Zapruder film. What was in the regular issue a black-and-white, fuller sequence of frames is swapped out for a more limited, in-color, and somewhat magnified sequence of frames. The captioning is also very different. One could, of course, argue that some of these changes were constrained by marketing choices. Color reproductions, something Life was famous for, would undoubtedly sell more copies. Given the relative expense of color vs. black-and-white, and the further magnification of some of the frames on the page, it might seem inevitable that parts of the previous frame sequence would be curtailed. 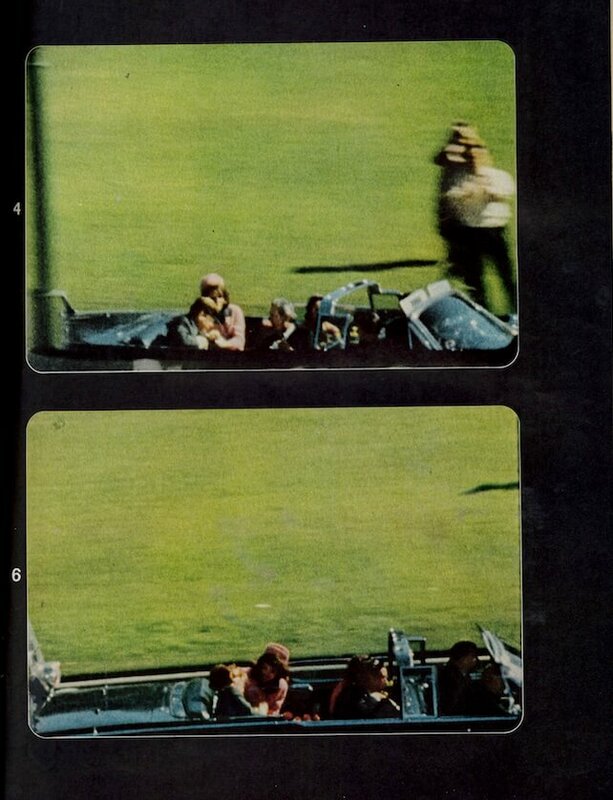 On the other hand, the special edition contains a number of other color photos besides the full-page blow-up, also in the November 29th issue, of Jack and Jackie as they step off Air Force One at Love Field, which tends to undercut the idea that the change in the presentation of the Zapruder frames was guided by purely economic considerations. 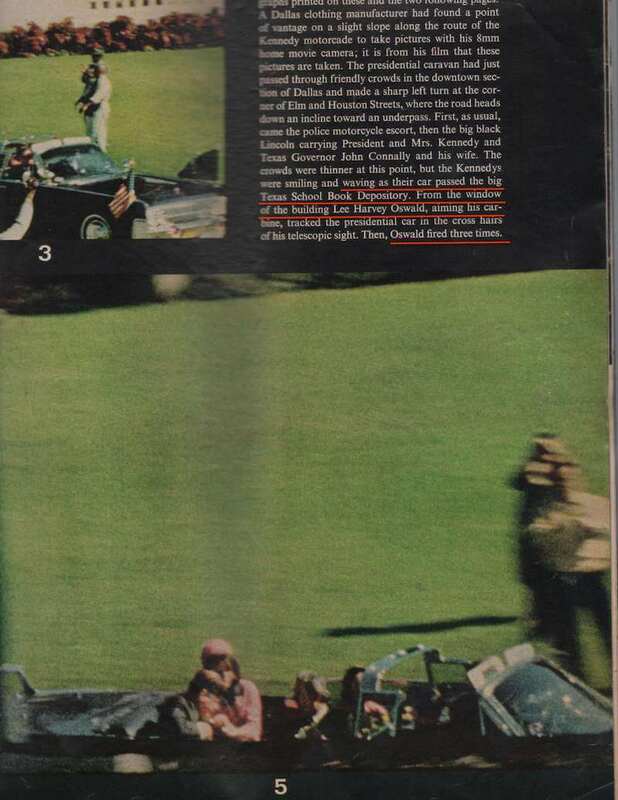 In any case, what was (quite conveniently) excised is telling: the frames following Z-323 depict JFK bouncing off the rear seat and Jackie scrambling out onto the hood, image sequences capable of raising questions in the reader about why JFK would move this way, and what Jackie actually might have been doing (other than crawling for help). 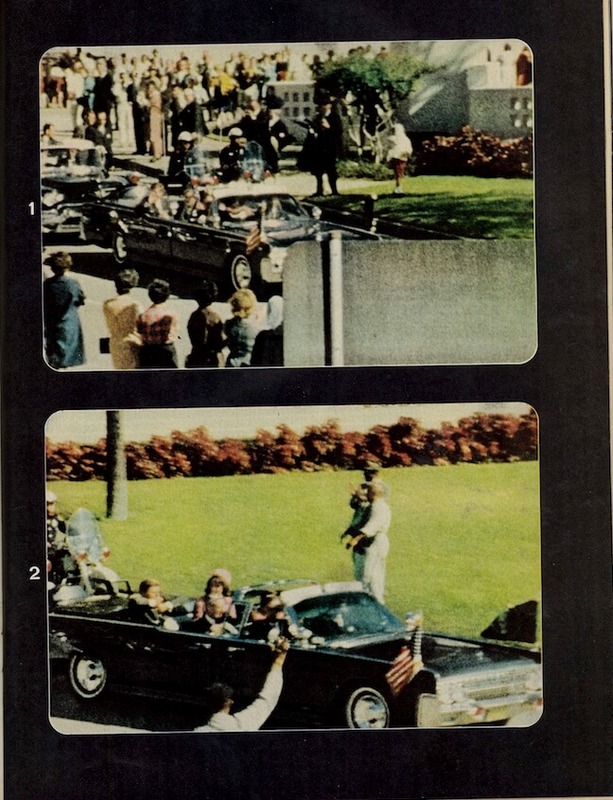 The fuller sequence also hints at the embarrassing interval before Clint Hill reached the limo (we see in the special issue only three of those frames, two of which occupy the entire fourth of the four pages, not shown here). At the very least, providing answers to these questions would have embroiled the magazine in something more easily left to silence. But even if these frames were innocently removed as a result of some sort of design decision, one frame substitution cannot so be explained. 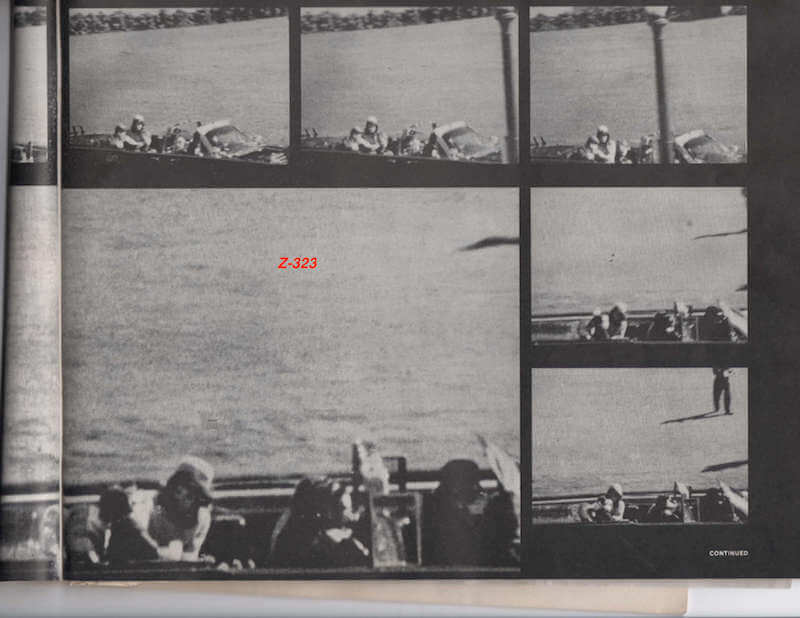 Indeed, we may ask ourselves, how is the fatal shot indicated in the black-and-white sequence in the original issue? The captioning is vague, but given the absence of both Z-312 and Z-313, and the fact that it is one of the larger frames, the only candidate for this is Z-323 (marked in red in the reproduction above). But where is this frame in the Memorial Edition? It has once again been removed, with Z-312 (also in red, above) now being used to “demonstrate” the bullet strike to the rear of the head (Z-313 was probably considered just too shocking for public consumption at that time). Granting Life the benefit of the doubt and attributing this change to “clarifications” afforded by the passage of two weeks between the two editions, it is still remarkable that no frame from the fatal wounding sequence after Z-312—much less Z-323—is printed in the special edition. Aside from this sleight of hand with frame selection and elimination, the Memorial Edition also exchanges the original text for significantly modified copy, which names Oswald and clearly places him in the TSBD, firing three shots with a carbine, and in general adds details that follow the official story more explicitly. In this regard, one is tempted to reflect further on the main caption it has borrowed from the original issue, not only because it now declares the shots to be from a single gunman, but because the switch to “horror” there almost seems too glib. At first blush the new diction might suggest an effort to render more vividly the shared experience of Dealey Plaza witnesses, to invest the description with evaluative, rather than simply objective, content (and direct that judgment squarely at the sole perpetrator). But the word also serves as a trace, a verbal stand-in for what has been visually erased, naming the very emotion that is simultaneously denied the reader through a fuller graphic re-experiencing of the event. If this rhetorical ploy is not cynical in origin, its final effect is nonetheless ironic. 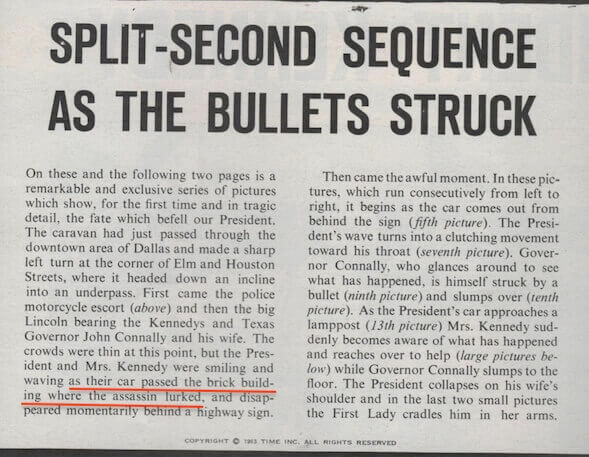 Since by this time the limousine was 50 yards past Oswald and the President’s back was turned almost directly to the sniper, it has been hard to understand how the bullet could enter the front of his throat. Hence the recurring guess that there was a second sniper somewhere else. 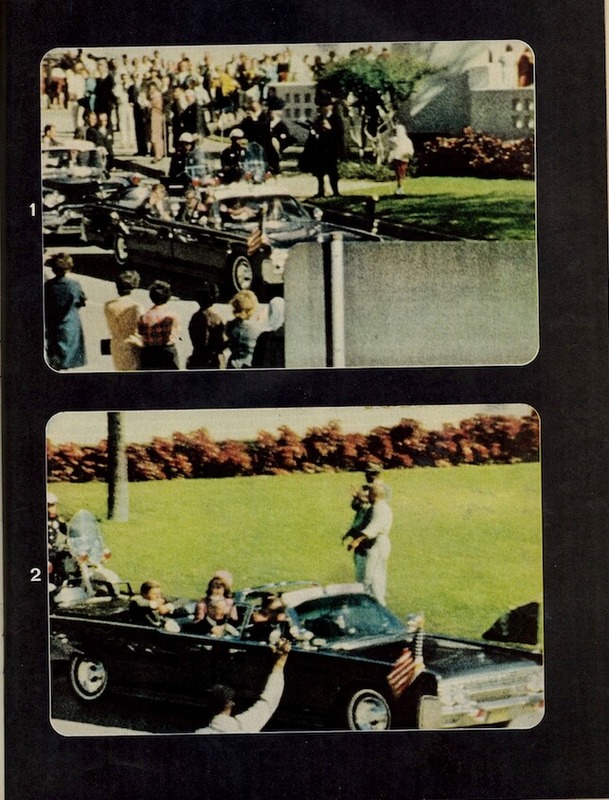 But the 8mm film shows the President turning his body far around to the right as he waves to someone in the crowd. His throat is exposed—toward to the sniper’s nest—just before he clutches it. Past the book warehouse the President turned to his right to wave to someone (1). Just as his car passed behind the road sign shown in the foreground the first bullet struck him in the neck. He clutched at his throat (2). Though less clearly articulated here, one has only to read further in the issue to find Mandel’s article reprinted under a slightly different title (“First Answers to Nagging Rumors: What Lay Behind Six Crucial Seconds”), but with essentially the same text containing the crucial gloss quoted above. The only way to sustain this ruse was to omit the intermittent frames which would have given the lie to this explanation. 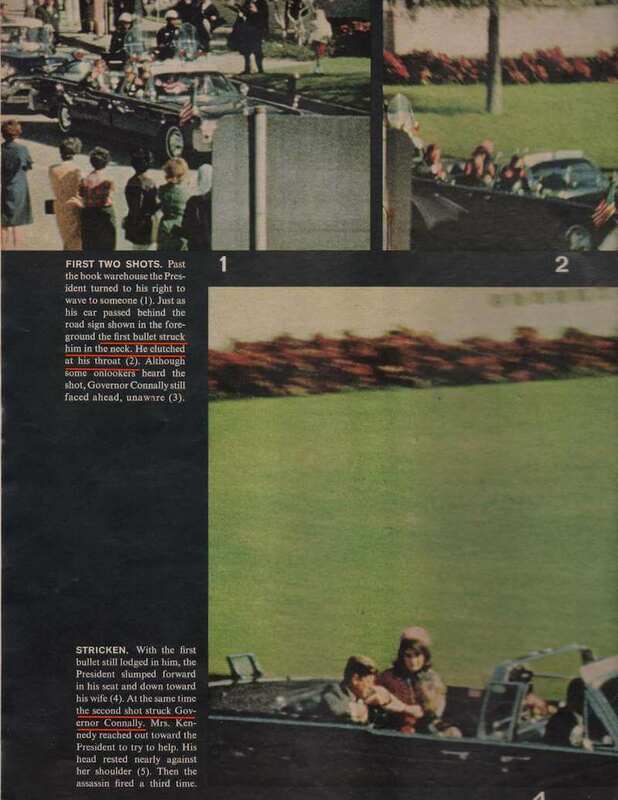 The frame with Kennedy waving has purposely been made the focus here; interestingly, it was missing from the black-and-white sequence in the November 29th issue, which shows only three of the frames before the limousine emerges from behind the Stemmons Freeway sign. In just four more days, however, this entire charade will no longer be necessary: on December 18th, the NYT and Washington Post will relate “autopsy findings” which appear to derive either from the FBI or possibly some earlier, destroyed version of the autopsy report, where the wound in the back/shoulder does not exit and the puncture in the throat is from an exiting fragment from the head shot; see this article by Jefferson Morley from 2012. 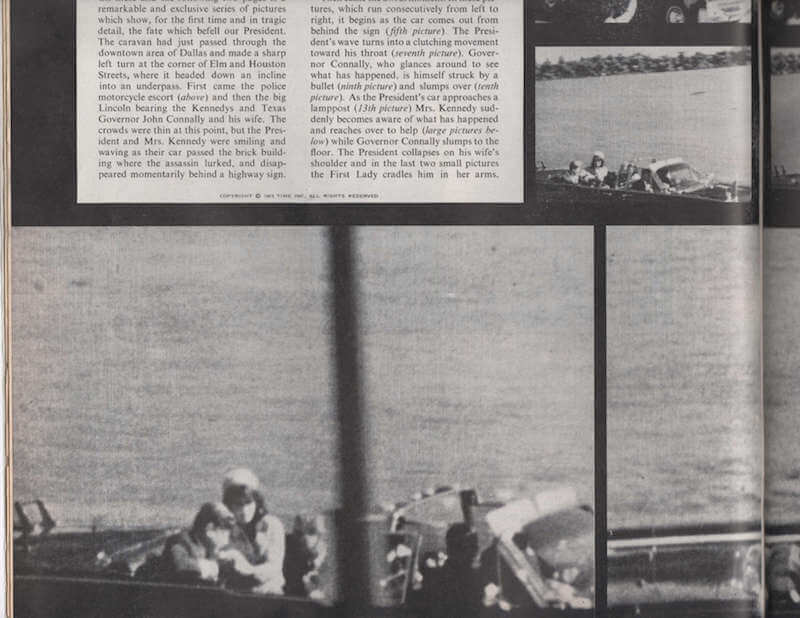 Together with the Mandel story, the frame sequence evidence we have presented above establishes that at least three times in less than a year Life colluded in deceiving the American public about the circumstances of President Kennedy's assassination.